Legislator William R. Spencer recognizes Max Orza, winner of the annual “Be Pool Smart” poster contest. First grade student Max Orza was recognized by Legislator William R. Spencer, M.D. as the winner of the annual “Be Pool Smart” poster contest. Centerport, NY - June 21, 2017 - Max Orza, a first grade student at Washington Drive Primary School in the Harborfields District, was recently recognized by Legislator William R. Spencer, M.D. 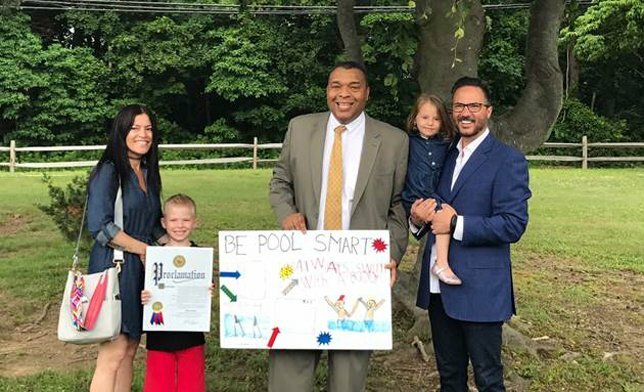 as the winner of the annual “Be Pool Smart” poster contest in the 18th Legislative District. Since 2007, the Legislature has welcomed the opportunity to continue keeping the pool safety conversation with our elementary students afloat. Activities such as this help to open up a dialogue and get students excited about a very important topic. Each year, approximately 3,500 people die in accidental drowning incidents in the United States. For every person that dies from drowning, 5 more will receive emergency medical care for swimming related injuries. That is why it is so important to reinforce safety measures for all swimmers hitting the pool or beach, especially our youth. Never leave a child unsupervised near a pool. During social gatherings at or near a pool, appoint a “designated watcher” to protect young children from pool accidents. Adults may take turns being the “watcher. “When adults become preoccupied, children are at risk. If a child is missing, check the pool first. Seconds count in preventing death or disability. Go to the edge of the pool and scan the entire pool, bottom and surface, as well as the surrounding areas. Do not consider young children to be drown-proof because they have had swimming lessons. Children must be watched closely while swimming. The best preventative step one can take to prevent drowning and other related injuries is to take swimming lessons and to learn CPR. By taking lessons, you are not only protecting yourself, but you will be prepared to help if an emergency situation arises. To locate a swimming or safety class in your area, visit http://www.redcross.org/take-a-class/program-highlights/swimming. Subject: LongIsland.com - Your Name sent you Article details of "Suffolk County Elementary Students Learn to “Be Pool Smart”"